GPS speaks with Duncan McCargo, a professor of Southeast Asian politics at the University of Leeds in the UK and author of 'Tearing Apart the Land,' about the ongoing protests in Thailand, what the demonstrators are hoping to achieve, and whether the military is likely to intervene. 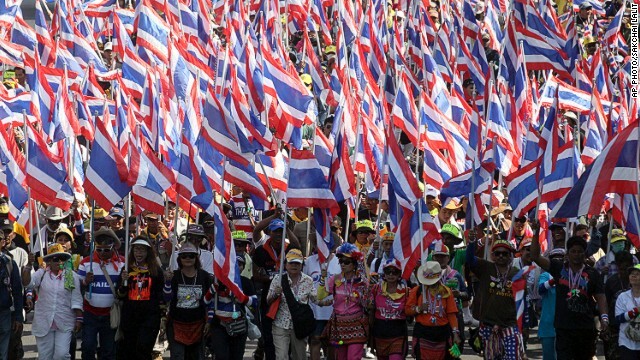 Anti-government protesters in Thailand have launched a campaign to “shut down” Bangkok. What are they so unhappy about, and what are they trying to achieve with this latest demonstration? The protesters are unhappy about the political direction which Thailand has taken for more than a decade. In the past, Thailand was run by a relatively small Bangkok-based elite which I term “network monarchy,” centering on the palace, the military, the bureaucracy and major business groups. While electoral politics have been the norm for more than 30 years, elected governments needed the blessing of this network in order to remain in office. Without this endorsement, governments quickly collapsed – or were removed by military coups. Conservative groups in Thai society, including the Bangkok middle classes and voters in the upper South – stronghold of the Democrat Party – have normally backed the ruling network. Since the 2001 general election, however, most Thai voters have consistently supported parties linked to former Prime Minister Thaksin Shinawatra. Pro-Thaksin parties with strong backing in the populous North and Northeast won solid majorities in the 2001, 2005, 2006, 2007 and 2011 general elections. The Democrat Party squeaked a narrow election victory in 1992, but has not won convincingly since 1986. Protestors are furious that Bangkokians no longer have veto power over election results; indeed, they feel they are no longer in control of “their” country. They claim that Thailand has been held hostage to the corrupt financial interests of Thaksin, his family and his cronies. The real picture is much more complicated. Voters in the North and Northeast are no longer poor farmers, content to be marginalized and patronized by their “betters” in Bangkok. Thaksin has not created the wave of electoral resentment against the Democrats and the power of the capital city. He has simply tapped into that resentment for his own ends. The protestors appear to have no clear political agenda other than a desire to “return” Thailand to an imagined pre-Thaksin era in which the ruling network and its supporters can still call the shots, and provincial voters can be marginalized. In the short term, they are trying to provoke a military coup of some kind. There was a lot of skepticism when Thai Prime Minister Yingluck Shinawatra took office in August 2011, with many expressing concern that her election would simply enable Thaksin, her self-exiled elder brother, to exercise influence through the back door. Have these concerns been borne out? There’s no doubt that Thaksin has remained an influential figure, working through and behind the Yingluck government. But Yingluck hasn’t been Thaksin’s “clone,” as he originally hoped, and there has been ample evidence that she was often able to set her own agenda and to form her own political alliances. In particular, it’s clear that her government couldn’t have lasted nearly 30 months without receiving an informal green light from the traditional establishment. An elite deal was in place between Yingluck, the network and the military to paper over Thailand’s political divides and allow for “business as usual.” This deal partly collapsed as a result of the abortive move to push through amnesty legislation in late 2013 – where Thaksin clearly overplayed his hand – and partly because the Democrat Party and anti-Thaksin forces set out systematically to sabotage the pact. How can and should Yingluck’s government respond to these protests? What do you see unfolding in the coming weeks? All Yingluck can do is continue the current policy of being very reasonable and diplomatic, not unnecessarily escalating matters, but pressing firmly ahead with plans for an election. It would be very useful if academics or other respected figures in Thai society could help to broker some sort of compromise solution to avert potential violence. The military has played an active role in Thailand’s political past, including overthrowing Thaksin’s government in 2006. Do you see it playing a significant role in the latest unrest? The reluctance of the military to intervene directly in the present crisis has illustrated the residual strength of the longstanding deal which kept Yingluck in office. The military is well aware that a coup would only further exacerbate Thailand’s polarized politics, and that the Army would be blamed for whatever went wrong. Nevertheless, the protestors will try their best to push for such an intervention in the days and weeks ahead – since a military coup would be the best means for them to advance their agenda. « Previous entryWhat I'm reading: Has U.S. fogotten how to conclude wars? all articles about thai uprising on CNN are written pro-government. this is so obvious. do your journalists talk with Thai People? Do you journalists talk a little bit of Thai? i don't think so. if so you would write about the true scandals today. The rice scheme of the actual Thai government is all about corruption. The anti corruption agency just found out that 15 of Yingluck Shinawatras ministers are guilty of corruption. Yingluck herself is heavily involved, she got the warrant to speak about this in front of the anti corruption agency. other news today (read the wall street journal): the rice farmer still wait for their money of sold rice (5 months already). the Thai government has no money to pay them – because it all went in the pockets of the 15 ministers. if you ask them, what happened, they will answer: we were democratic elected. it,s just a joke. like all this biased journalism here on CNN. do your job now! I work in a private company that always work with every government. Thaksin and Yingluck government are by far the most corrupted. As a Thai we tend to accept some level of corruption but this is way beyond that level. I also know many people in the rice business. The rice scheme is one of the most corrupted policy in the history. Every step of process in this scheme benefit Thaksin's friends and family. Read BBC, CNN, Time….etc. on Thai Turmoil; they all talk about class warfare between rich & poor, democracy (& democracy & democracy)….etc. But most barely talks about outcomes of what this administration has done so far in last 2 years; badly managed rice mortgage scheme that puts Thai economy to the point of failure or massive corruption that prompts Transparency International to degrade our rank from 88 to 102. It would be nice if news includes these in detail, they are major reasons why they are on the street now too. The GDP to debt ratio is still low so you can forget about all that bankruptcy nonsense. And as for corruption, according to the World Bank, it was somewhat better under Thaksin than under Abhisit and...oh...who was the other guy? Oh, yes. Suthep, a man whose personal corruption brought down the last elected Democrat government and who has since maintained his lifelong habit of shovelling as much public money into his own pockets as he can. But now – unfinished police-stations aside – he's magically become the saviour of public finances and – murder charges notwithstanding – the arbiter of what is right and wrong in public life. It's a plot twist of such a staggeringly stupid, unbelievable nature that even Channel 7 soap-writers wouldn't touch it. Really. If you want your transparently selfish, self-serving and, frankly, morally repulsive goals to be taken at least a little seriously, you're going to have to find a somewhat less cartoonishly hypocritical person to rally behind. Academic drivel I am afraid. Events which show how much on grand scale was the Shinawatra government totally kleptocratic. To much emphasis on the so called elites. Many many normal people in the demos. Also many from the North East. Now the Counter Corruption Commission's report is out it will show how nasty the corruption got. Thailand needs to start with a clean slate. Thailand government should wake up and kick USAID out of the country! That may not resolve this crisis, but will be a good start if they want to prevent it happening again! duncan mccargo " the professor "shame on you,how much do you get from that "the fugitive " taksin even the usa.president call him "a crook " don't say something that you're not know. Thailand is pretty much corrupt to the core. If another party was to win or remove the present regime, all that would change is that a slightly different set of criminals would be reaping the payoffs. Duncan, you are a part of this corrupted fugitive-backed government.